Exciting job opportunity with INTENSE! INTENSE Enterprises, Inc. has an immediate need for a part time helper . We manufacture and sell automotive racing parts for the GM 3800 engine, GM 2.0L Ecotec engine and GM LSx variants including the new Pontiac G8. Duties: Managing inventory, stock room and garage maintenance, shipping orders, and other various odds and ends tasks. We will consider all applications received by Friday June 6th, 2008. New FWD Record equals lower shipping rates! For those of you who waited to purchase something big and heavy you get to save 4 cents now! We dropped domestic UPS ground shipping to match Bob’s latest record breaking run of 8.90! View Licensed to Kill for more information. We were at 100% Duty Cycle on the injectors around 5000 rpms. We will be adding the 60# injectors along with a new exhaust and going back to the dyno. The engine mods installed so far are the APS twin turbo kit, 160 degree thermostat, AR103 spark plugs gapped at .035″ and an INTENSE/Dyno Tune custom tweaking. With only 6.5 psi of boost, the stock fuel injectors maxed out right around 5,000 rpm in fourth gear. Since it’s not a customer’s car, I went ahead and pushed it a little higher. Peak power came around 5,300 RPM, which is a bit beyond the stock peak of 5,200 RPM. The best we could do last night was 473 WHP, for an increase of 182 WHP over stock with only 6.5 to 7.0 psi of boost! Not bad at all for pump gas and a SLEEPER of a car. We’ll install larger fuel injectors in the next few days and try to find someone to build a 3″ dual exhaust, and then we’ll shoot for 550 WHP next month. I’m sure by July I’ll be looking to turn the boost up, and then maybe we’ll try to do this 200 mph video run that no one knows about yet. 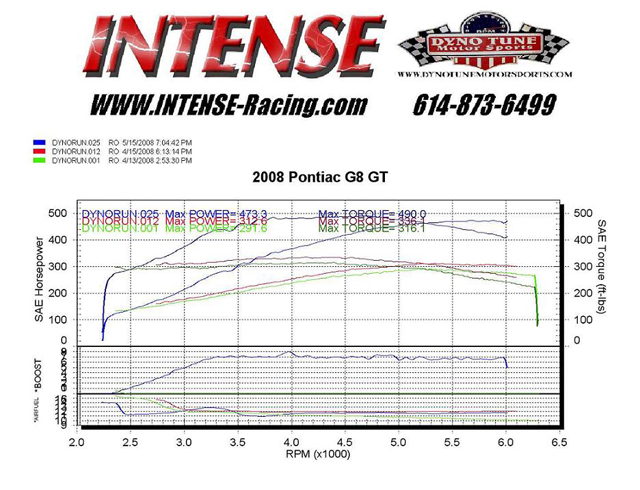 In the above dyno chart, the green lines are completely stock, the red lines are with an INTENSE/Dyno Tune and the blue lines are with the APS kit installed. Believe us when I tell you that this car is an absolute BLAST to drive! We completed the install of the APS Twin Turbo Kit on our INTENSE G8 GT this week. The kit is top notch with excellent features and instructions. You can see pictures of the install at INTENSE G8 GT Twin Turbo Setup. Look for dyno numbers soon!